As a child Glen Hayward played in a rusting Corolla he found abandoned in an Aramoho paddock. As an artist he is still playing, recreating the car of his childhood with adult skills and perspective. The vehicle, which rests on “concrete” blocks, will never rust. Everything from the upholstered seats and cigarette butts to the beer bottle and bottle tops, the cow’s skull and rough, exterior panels is made of wood; including the blocks. “You know how kids create a space under the couch or under the table with a blanket? “There was a way that the car interior space, when the grown-ups had left, became this amazing magical space. “This was a car wreck and it was upside down, but it [imaginative play] even happened when mum and dad were in the gardening store and we got to hang out in the car and pull all the [levers] and things,” Hayward said. The paddock is in Field St where Hayward lived for the first 10 years of his life. He returned to Whanganui at 40 where, as an established artist, he continues to work. The car has been shown in Sydney, Dunedin and Auckland and continues to change, as do people’s memories, accumulating objects and history/chronology. 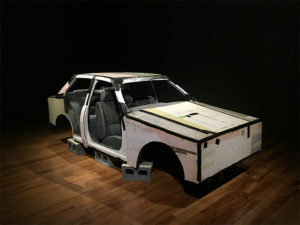 Behind the driver’s seat, Hayward has placed feedback about the car from a child to “John” the education officer at Dunedin Public Art Gallery. In a conversation two drawn characters decide the car is “weird but cool”. “Which is something like my memory of that car,” Hayward said. He has since added black outline paint on the exterior to make it look more like a child’s drawing. The car, spot-lit in the dark space of the Sarjeant, invites reminiscence and reverie. It’s a conversation starter. Take the perception we have of cigarette butts being “yucky” for example. Hayward was into space and space exploration. The rusty Corolla little Glen played in was upside down, so for him it was the Endeavour from Star Trek or the Blake’s 7 ship. The beer bottle, crate and candles on the back seat suggest the teenage world, and ritual. And the snail is possibly enjoying a snack of car paint. There are many different worlds within this car, including those of viewers. Hayward reflects on how, as a man, he is recreating the space from childhood – the interior, or inner worlds, being more finished, more real, more important to him than the exterior. The exhibition called Dendrochronology (tree ring dating), which runs at the Sarjeant Gallery until December 2 will be the subject of a talk by Hayward at 11am on Saturday. Hayward said he loves the scale of Whanganui and being part of the arts community. “I think the redevelopment of the Sarjeant is an extraordinary opportunity for Whanganui.